I always have a hard time starting sewing projects because I tend to think they are going to be more complicated than they really are with all the marking of the pieces, the staystitching, trimming seam edges, ironing, etc. But once I get going, it seems that I have a hard time stopping. Such was the case last night. Here's part of the bodice with the contrasting edging at the top. 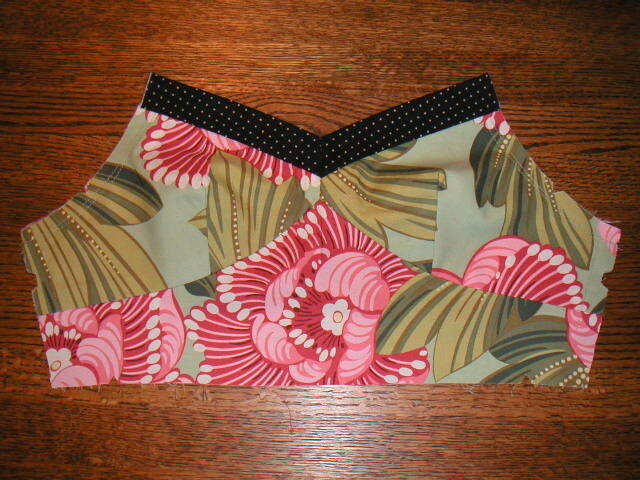 Next I'll be adding the contrasting waistband. I really like the tropical print and polka dots together.